As usual, I have kept very busy this past month. I took a trip to Ogden to attend workshops for my part time job mentoring new teachers in the district. I may be a little crazy but I really enjoy the interaction with those teachers who are just starting their careers. I remember how frustrating it was for me when I first started teaching so anything I can do to ease their lives a little should be a good thing. I met with all six of the teachers I have been given this year and will meet with them each month when I am back in Ogden. This will give me an opportunity to visit my family while there too. 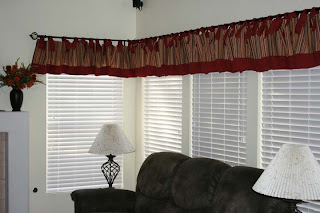 On a different note, I have finished yet another of my many projects in our house in Vegas. 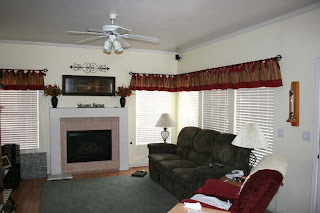 I made valances for the family room windows and updated the fireplace decor. I was pleased with how they turned out. Here are some pictures. Now, on to the next project. I think painting a bedroom in on the docket since we started taking down the wallpaper border yesterday. Thanks Larry for allowing me to keep working on things in the house. I have to have something to work on. Looks great Kay. I love the color the valances add to the room!! The valences look awesome mom! What I wouldn't give to have some of your talent and patience for stuff like that!